Arthrogryposis (arthrogryposis; Greek arthron — a joint + gryposis — a curvature) — heavy inborn deformation of extremities. At this state at the same time there are a clubfoot, talipomanus and multiple contractures that is connected with changes in muscles, joints, periartikulyarny soft tissues. 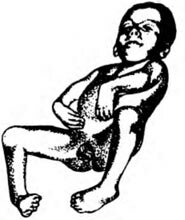 The term "arthrogryposis" is entered in 1923 by W. Stern. The etiology and pathogeny are found insufficiently out. The leading significance is attached to influence of various infectious agents possessing the teratogenic properties breaking normal development of an embryo. The clinic is quite typical and is expressed available contractures in large joints, an underdevelopment of muscles and nerves. Hips usually knaruzha rotirovana, and upper extremities — inside. At survey the smoothness of contours of a joint is noted. The active movements in the affected joints are absent. The brush is in the provision of palmar bending, abduction or adduction, but prehensile function of fingers remains. Shins and shoulders are atrophied. Foot is deformed and is in ekvinovarusny situation (fig. 1). Treatment is long, systematic, conservative and begins at once as soon as the diagnosis was made. It is directed to elimination of deformation and contractures. Since the birth carry out remedial passive, corrective gymnastics and massage. On 2-m month of life apply stage redressiruyushchy plaster bandages to correction of contractures and a clubfoot. The child till 2 flyings put to bed in a plaster bed for the purpose of the prevention of recurrence. Carry out mechanotherapy and apply orthoses. Operational treatment is directed to elimination of deformations (an epicondylic osteotomy, an astragalektomiya). Fig. 1. Arthrogryposis. Contractures of joints of upper and lower extremities.